I haunt the markdown sections of the grocery store and take advantage of good cuts of meat when they are marked down. Ribs, steaks, pork loin, brisket, all sorts of meats are frequently available after a heavily promoted sale. I pick up packages of sirloin steak when I come across them. If I’m not going to use it within a day or two I’ll cut the steak in very thin slices and pack separate handfuls in Press n Seal storage wrap and freeze it. Then when I’m in the mood for steak I’ll take a portion out and defrost it in the microwave for a few minutes and then make my sandwich or salad. 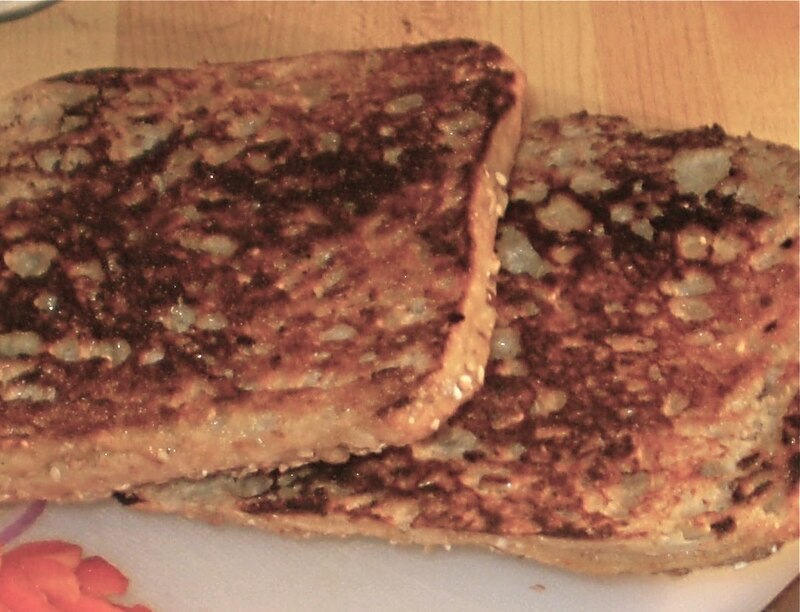 First cut the bread in half and toast it in a puddle of olive oil on a hot iron griddle. Next saute the peppers and onions on the same griddle until softened. Move them to the side and put the steak on the griddle with the marinade. Place the toasted bread face down on the pile of meat and vegetables to steam and keep warm. 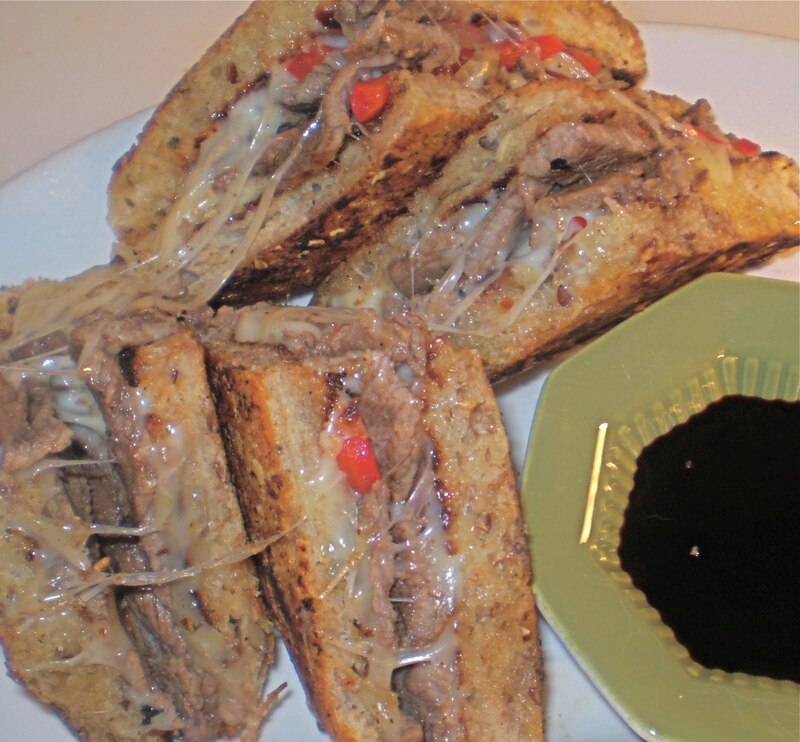 After a few minutes, it won’t take long, build the sandwich by covering each slice of bread with provolone cheese. Add a generous pile of meat and vegetables and place the sandwich back on the griddle. Use a bacon press or an iron skillet to press the sandwich to flatten. Turn after a few minutes to brown on both sides. 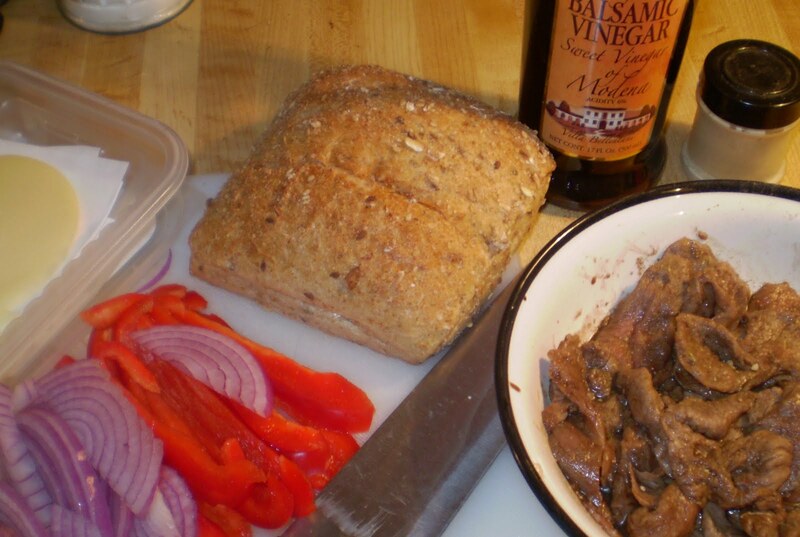 Cut the sandwich into quarters while still on the grill and serve with balsamic vinegar for dipping. 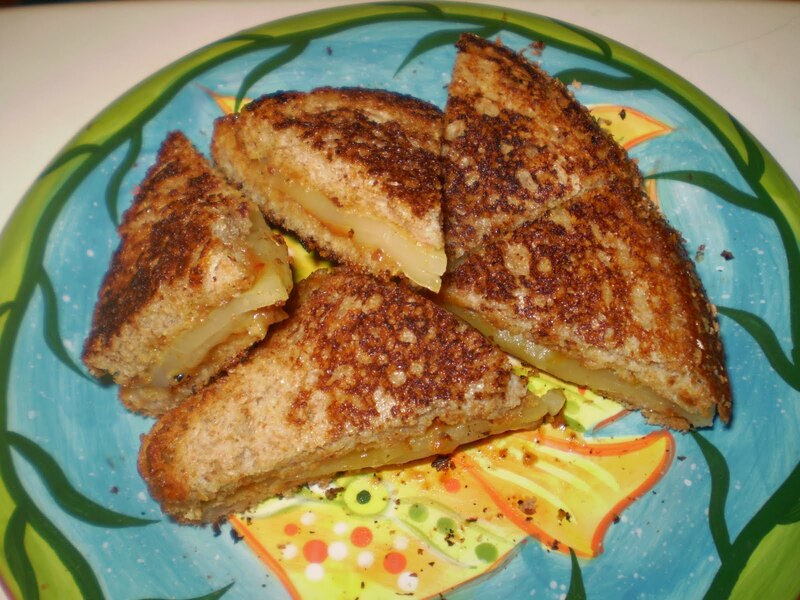 Grilled cheese sandwiches were a staple of lunches and light dinners in the 60s. They are fast and easy. It’s something kids will eat—most of the time. 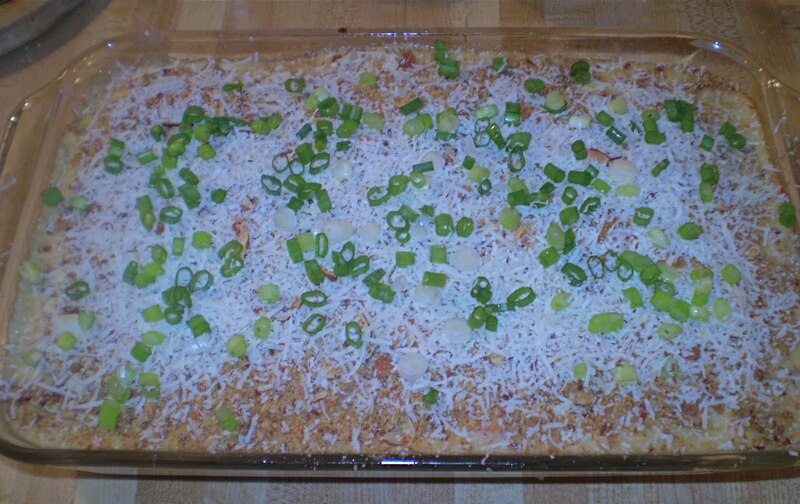 Bread and cheese were almost always in the pantry, so it was a great go-to item in a pinch. The recipe Mad Men’s Betty Draper, or her “girl” Carla might have served Sally and Bobby was likely made with Rainbow bread, Miracle Whip, American cheese and Oleo. Not bad, but not enough flavor for me these days. So tonight I was in the mood for a grilled cheese, with a twist. Oh, my gosh! I had no idea this sandwich would be soooo tasty! I bought the Cranberry Honey Mustard a few months ago for making homemade salad dressings. This was the first time I put it on a sandwich and it added the perfect zing to this simple grilled cheese sandwich. I will be using this a lot in the future. First I put my old trusty iron griddle on the burner and turned the heat to medium. This old iron griddle—I think I got it at an estate sale—is about a foot square with shallow sides, ideal for turning sandwiches. I started with a very generous layer of Cranberry Honey Mustard on two slices of bread. Then a double layer of sliced provolone. I slapped the sandwich together and sprayed the top piece of bread with olive oil and splashed the griddle with olive oil. I put the oiled side of the sandwich on the griddle and sprayed the top of the sandwich with more olive oil. A few minutes later I cut it into eight little triangles and had eight little bites of creamy cheesy goodness with the sweet tart surprise of cranberry mustard.